The fire department said crews responded to the call around 1:30 a.m. and found a house "with a significant amount of flames and smoke showing from the rear of the home." 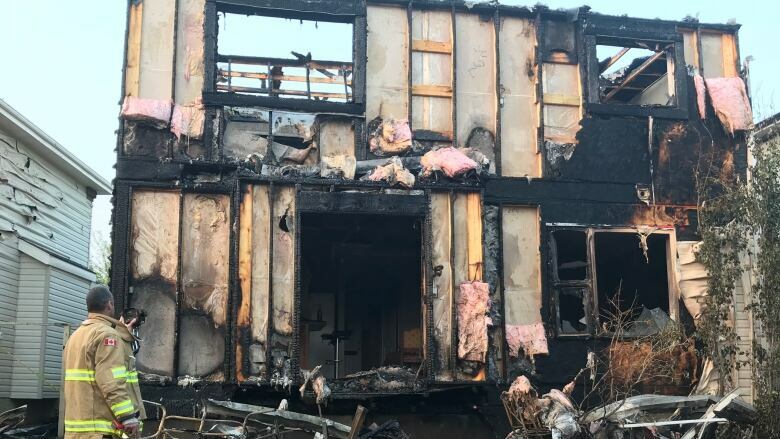 The fire in southeast Calgary broke out around 1:30 a.m.
Three people are without a home Friday morning after a fire in the southeast Calgary neighbourhood of Chaparral. The fire department said its crews responded to the call around 1:30 a.m. and when they arrived on the 100-block of Chaparral Crescent, they found a house "with a significant amount of flames and smoke showing from the rear of the home." The fire was also "extending" to neighbouring houses. Tim Redwood lives two doors down from the fire and said he was woken up by someone knocking on his door and ringing his doorbell. "I got up and I ran to the back of the house and looked in this direction, toward the burning house, and saw which house it was. Yeah, that was pretty scary," he said. "The whole back of the house was just in flames and then it spread toward the front." Redwood said he was immediately concerned for his neighours' houses and for his own. He got out his garden hose and started spraying down his property. Crews battled the fire with hand lines and an elevated water tower, according to a news release. No one was injured. The cause of the fire is still under investigation.